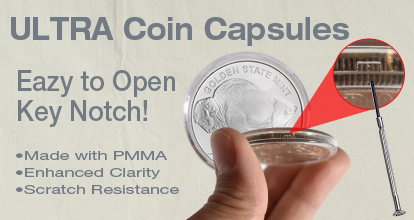 With the proprietary notch design, opening a coin capsule is easier than ever: it's as easy as turning a key. Simply insert a mini screwdriver into the notch and twist to open. No more wasting your day finding the "tongue" or "inner lid" of a coin capsule. Using the notch design, you can rest assured your coin capsules will never accidentally pop open either and be exposed to that nasty toxic element we call oxygen. Scratch resistance of ultra coin capsules maintain the pristine look of your collection even longer than standard fare coin capsules. The new EvoCore coin capsule is a product of precision, designed as a lens for your coin and formed in highly polished molds for a flawless surface. As mentioned earlier, the EvoCore coin capsule is made with PMMA, which is known for its clarity, strength, scratch resistance, and safety for coin storage.